Sober Look: Is Euro basis currency swap a better indicator of ongoing Euro stress (than EURUSD)? Is Euro basis currency swap a better indicator of ongoing Euro stress (than EURUSD)? In the past few months, even as all other indicators such as sovereign bond spreads (and even Spanish 3 month T Bill yields) have blown out wider, the EURUSD spot rate has remained very resilient, hovering in a very tight range around $1.35 to US $. There have been many reasons that have been postulated for this including French bank repatriating EUR (buying EUR while USD denominated assets) to plug capital holes and ECB remaining steadfast in not giving in to calls for a massive QE program in Europe. Meanwhile, another indicator of the bank funding stress can be seen from the 3 month Euro basis currency swap below. At 134bps, it has reached levels not seen since the Lehman bankruptcy. 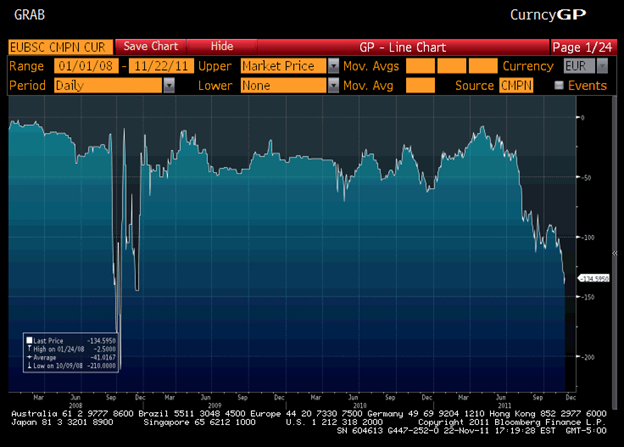 The Euro basis swap shows the cost of converting floating rate EUR payments into USD. It is often viewed as a better and true indicator of stress. Something to watch out for if hits -150bps or lower.